Thermal Electric Generator from concentrated solar, designed to float in water, small scale power anywhere in the world. This project is a submission for the energy harvesting challenge. My local area is heavily surrounded by over 600 miles of water ways. This device combines three separate ideas. First being solar oven absorption , Second Concentrated solar and Third " TEG" Thermal Electric Modules using Seebeck Effect current generation. Having power harvesting in a pretty package means it can exist in places electronics and wired power normally cannot go. Lakes, rivers, hunting, off grid camping trips and even float these in the water fountains or in pots of water by park benches. This project is a way to bring concentrated solar to a to everyone with the access to the tools to make them. Version one is only designed for 1 TEG unit as proof of concept. It will generate 1-3.5 volts depending on sunlight. However version 2 is designed to collect and heat 9 TEG units. Scaled up from 60 mm center to a 6 inch center. 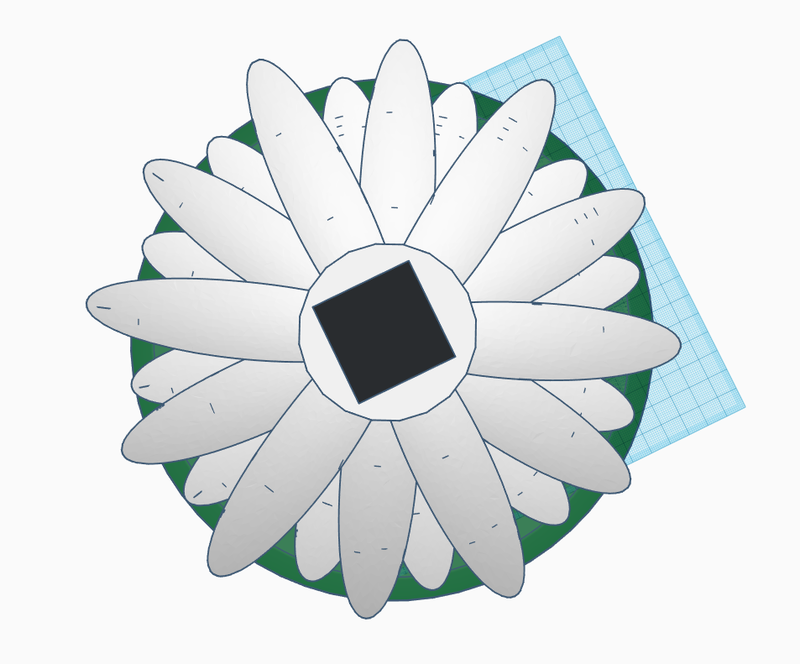 In version 2 the petals and center must be printed separate assembled. This is a solar concentrated thermal collector. The light hits the petals which reflects towards the center of the flower frame. The center is a flat black solar collector that can reach a couple hundred degrees in a few minutes. In between the collector and PLA frame there is fiberglass cloth layers that protect the plastic frame from heating up and melting. In the center stacked 1/4" plates with thermal adhesive in between transfer the collected heat to the bottom. On the bottom of the frame is where any TEG modules are adhered. Around the edges they are sealed off from outside water or air with silicon adhesive. Finally there is the last plate on the bottom of the TEG modules that a heat sink may mount to. In my case I am using a 125 watt rated copper pipe heat sink that transfers the heat into the water below the Lily power generator. in total the heat is collected, passes through the thermal transfer tower, through TEG generating electricity and dissipated through the aluminum to water heat sink. Non functional pieces - there is a 1 inch thick disk of foam acting as a lily pad to float the flower frame just above the water surface. The heat sink below the water acts as a weight that keeps the pad constantly upright. From the TEG the red and black DC wires leave to a outside location to a dc to dc power inverter to power a phone by 5 v usb. 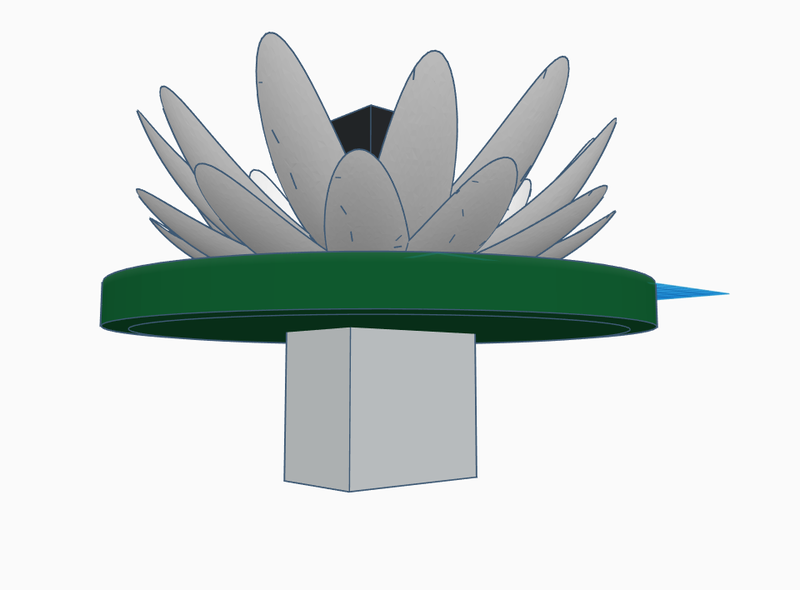 topview 3d representation of the head collector and the heatsink on the bottom. I will not draw the details as it will take forever so no good reason. 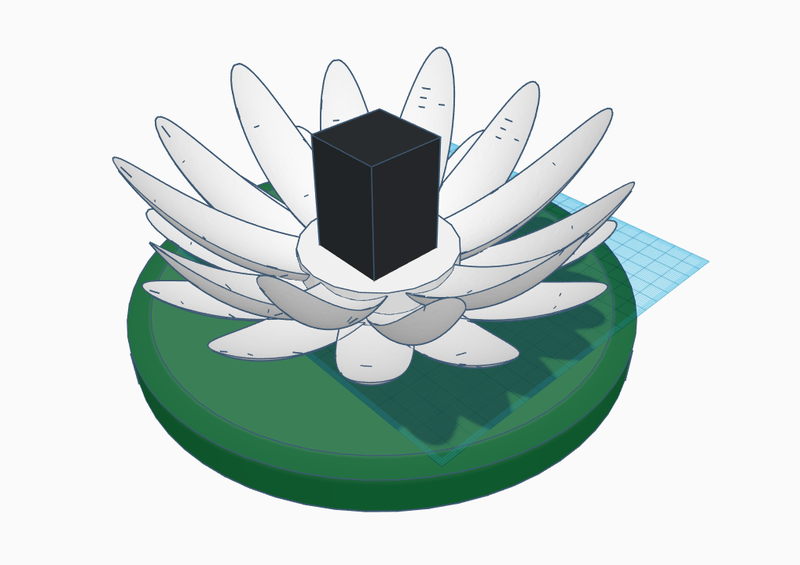 3d representation of the head collector and the heatsink on the bottom. I will not draw the details as it will take forever so no good reason. This is the newest model as of 7/11 . It has three sets of petals and varrying agle to reflect light at the center about 4-6 inches above the center depending on the angle of the sun. 5 × TEG Thermal Electric Generator Seeback module this uses hot / cold temperature transfer to generate voltage. 1 × DC to DC converter regulate voltage, step up from low voltage to 5 volt and usb output. 1 × CPU heatsink, $10 on amazon this is the cold end that is submerged into water to attract heat transfer through the seeback modules. .928 volts half submerged in water on a 85 degree day at 1 pm , cloudy. Highest temp today I read at the center was 54 degrees C about 127 degree Fahrenheit. I put two 500 watt halogen directly in front of the solar collector. It hit a temperature high enough to scald you if you touched the black plate a couple seconds. I need to buy a new meter since mine got rained on so I can check the voltage and amperes. Ok so the TEG module has been adhered using thermal adhesive. Then sealed up with 100 percent silicon all the way around. All that is left is to get a foam disc from hobby lobby. Paint green , cut the hole for the heatsink to drop through and the floating heat collector will be operational as intended! Ok update on ongoing progress, the reflection Mylar film is glued to the petals. I am disappointed that in pictures it looks like tin foil, but this is because the Mylar has zero give to stretch into place to smooth and wrinkles. I think this would work much better with reflective window film because it can be formed and has ah adhesive layer as well. Anyways functionally the wrinkles should not make any difference at all. The LTC3108 TEG power harvester is probably a more efficient power harvester than a 5V dc-dc converter. As the leafs have the same width as the collector it should be enough to curve them in one direction. This allows using simpler ways of manufacturing. E.g. bending sheet metal, tensioning a sheet of plastic with a string, bending wire as the border and gluing reflective foil in between. I wonder if the leaves could actuated by something heat driven - like a bi-metal strip or a wax motor. The actuator would "try to get into the shadow" and by this moving the leaf to point the reflection onto the collector. That&apos;s just the rough idea. It probably needs a lot of thinking before this is actually feasible. The alternative would be a mechanical solution in which the medium elevation of the sun is fixed and there is something like a ring that is turned my a motor with the right side towards the sun and tilting all the leafs accordingly. But water and intricate mechanics don&apos;t mix well. May be it is easier to tilt the whole flower. E.g. by a weight under the waterline that changes the center of gravity off axis. It could be driven by a set of thermal actuators sitting on top of a pole in the middle over the collector. The ones pointing towards the sun would be warmer than the ones on the opposite side. Having them partially exposed on the top would give some sensitivity toward the vertical angle of the sun. To judge your reflector you can just have a look at it from different angles and check what percentage of your field of view shows the black collector or its reflection. All reflector area that is hidden or showing something else it not contributing when the sun is shining from that angle. Computer heat sinks look the way they look because it is hard to get heat from a metal into the air. Large surface area is needed and the aluminium is transferring the heat much better than air. This is all not true for water. It might be best to just dip the underside of the peltier element directly into the water. Or at most have a very thin heat sink with widely spaced rips to allow convection. 3D printing really isn&apos;t the right manufacturing technique for this. It should really be much bigger. Area grows with the square of the diameter. As this will have only a few percent efficiency at least have a reasonable area. May be start with 3 or 4 feet in diameter. This means you need a different way to build your reflectors. The design is completely unaware that the sun shines from other angles than right above most of the time. Depending on what locations are targeted it should work reasonably at least for a cone of may be 45°. For locations more north or south that may still be not good enough. Most of the area of the reflector is on the outer perimeter. Half of the area is on the outer 30% of the radius. Having spaces between the leaves there wastes a lot of area - it looks nice though. I wish I could offer more advice on how to solve these issues but they are hard problems that need quite some thought and research. There is a reason why reflector based solar power plants use sun tracking. Then it is best to write this explicitly (F or C) because in many parts of the world reading only "degrees" is understood as Celsius. How/where do you get rivers with about 60°? The hottest river I experienced was something like 28° in a really hot summer, like 35° air temperature. But anyway, I would try to use a heatpipe from the cold side into the water instead of active cooling. That saves power for the pump. I took your advice martin and purchased a amazon basics heatpipe heatsink. I think it will work well. This Buoy, with peltier modules attached, will use the Seebeck Effect to generate electricity using the ocean and the sun. A Simple Project Utilizing common and novel technology and techniques for solving laptop overheating issues without Active Cooling systems. You are about to report the project "Lily Power Pods, TEG + Concentrated Solar", please tell us the reason.